As followers of MN Bound's Eagle Cam are aware, yesterday was an eventful day in the life of a very young eagle chick here in Minnesota. Thousands of people around the world watched as the eaglet, less than three weeks old, struggled for hours trying to free its entrapped wing. 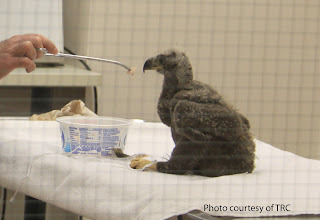 With the chick getting weaker and authorities concerned that the eaglet was entangled in fishing line, the Fish and Wildlife Service issued a special permit to allow intervention at the nest. 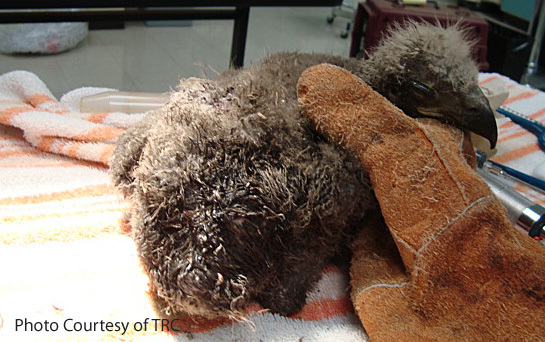 After climbing into the nest and freeing the chick's wing (which was trapped by nest structure, not fishing line), tree-climber and avian expert, Jim Mussel noted the chick's poor condition and chose to remove it from the nest, bringing it to TRC for medical evaluation and care. (Click here for the rescue video). When the eaglet arrived late yesterday, it was immediately provided supportive emergency care. 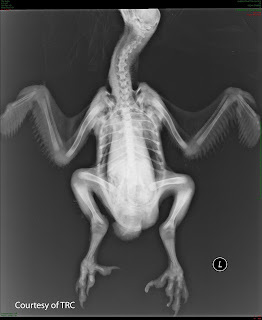 The chick's wing was bruised and swollen from being trapped and it had multiple wounds on its back that had become infested with maggots. With the chick very depressed and a bit dehydrated, we are staging its exams, diagnostics and treatment to prevent too much stress to its weakened body. This morning, the chick is stronger, eating well and looking substantially better. There are many considerations when working with a bird this age including preventing nutritional problems and abnormal behavior development. And we know that with no other chicks in the nest, the parents will not hang around for very long without a chick to feed. We do not yet know how long it will take the chick to recover enough to be returned to a nest (or even if it will recover enough). We will, however, keep everyone updated on a daily basis while the chick is with us. 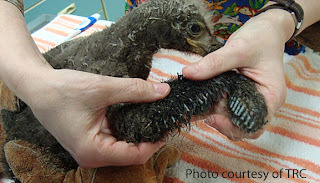 As always, we are very grateful for those of you who provide support for The Raptor Center's work - without you, we would not be around to assist in situations like this. For those of you who would like to know more or make a donation, please click here. Thank you all for the passion you have for these wonderful creatures! Awesome! You walk a fine line between allowing nature to care for itself and stepping in when necessary, and I appreciate the work you do! Thanks! Bless you Jim Mussel and everyone involved! I watched the entire rescue and wish this little guy well in healing quickly! I know mom has been to the nest a few times and hope she continues to do so when this baby is returned to his parents! I am so happy to have pictures and a report on Harmon. Thank you!! So grateful for all the stakeholders involved with the rescue and delivering this Lil one to your facility so that she can receive the proper care and treatment....under your loving care. Wishing this wee one a successful recovery. Hats off to you all. Thank you for all you do! You are probably being bombarded with eagle fans and fanatics, but all we want is what's best for Harmon. Keep up the great work! Thank you so much for your expertise, love and compassion. It was evident in the rescue. We know Harmon is in the very best hands and trust you with his precious life. it was wonderful to watch from here in fairbanks alaska the rescue and we pray harmon recuperats and parents are there for his return! As always, I APPLAUD the wonderful work you do! Thank you so much to the raptor center for going over and above...spending all day teaching an international group of rahab-ers to better assist the wildlife in their areas...staying after hours (on a Friday evening) to await the arrival of the eagle chick...knowing they had to be up early for their release event the next morning! You gals (and guys) rock! Any updates on this little one since his/her care?